70 million years ago, when dinosaurs ruled the earth, a particular species lived on the southern tip of the Korean peninsula - the tarbosaurus. The youngest of a family of tarbosaurs, Speckles is a curious and playful child. Along with his mother and siblings, he lives happily in the forest, waiting patiently to learn to hunt. However when that day arrives, tragedy strikes as One-eye, an older tyrannosaurus, attacks Speckles’ herd and tears his family away from him. Now on his own, he eventually teams up with another lost tarbosaur, Blue Eyes. But fate is fickle and Speckles’ troubles with One-eye are not over, and revenge, death, fear, and sadness are all in his future—as is happiness and hope. Han Sang-ho has previously directed for television, including the educational special <Koreanosaurus> (2008) for EBS. 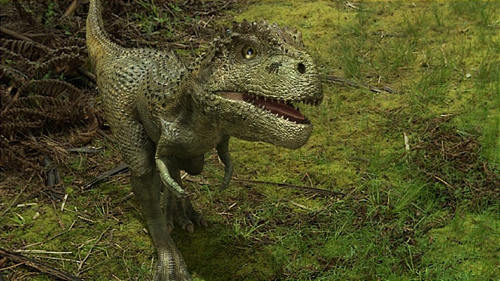 <Speckles: The Tarbosaurus> is his debut feature film.